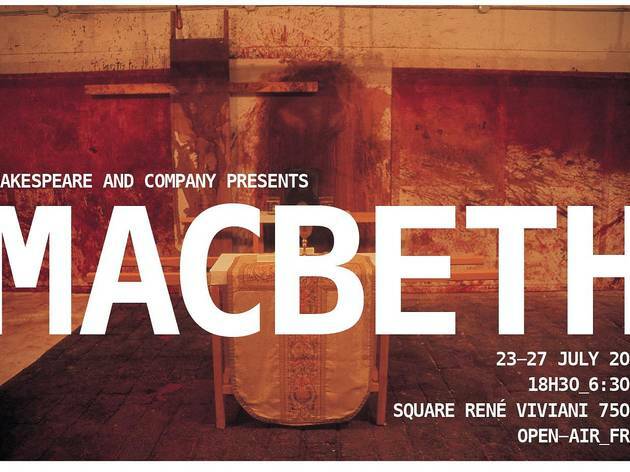 This July, Shakespeare & Company gets some welcome company in the form of Cressida Brown's avant-garde Shakespearean troupe, who'll be staging a new outdoor production of 'Macbeth' in the square on which the legendary bookshop stands. The Bard-en-Seine festival, held in Paris's literary heartland over the course of five summer evenings, fêtes not one but two anniversaries: that of the Bard himself (who would have turned 450 this year), and that of the outbreak of the First World War. 'Macbeth', the bloodiest and most unrelentingly tragic of Shakespeare's works, should lend itself well to Brown's 1914-set reimagining; given her track record of bold productions for the Royal Shakespeare Company, expect a visceral show, full of sound and fury. 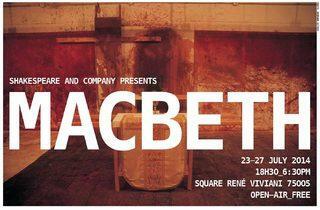 'Macbeth' will be staged in the Square René Viviani at 6.30pm daily from July 23 to 27 (Wed–Sun). The performances will be preceded by lectures or poetry readings at 4.30pm on every day except Wednesday.